Samuel L. Jackson rocks. Whether he’s killing snakes (on a Plane) being the brain to John McClane’s brawn (Die Hard With a Vengeance) or portraying an old, homeless, has-been boxer (this movie) he always gives a great, inspired performance. I think the man gets so invested in his roles because he chooses them carefully. You don’t see Jackson coming out with lots of movies every year. Often it’s not even one a year. 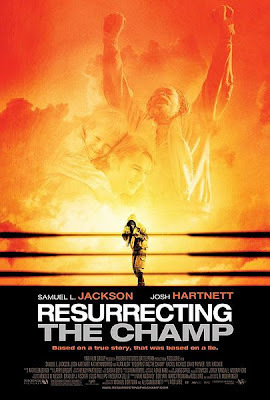 Whatever the case, he is an amazing actor, but, sadly, is really the only thing that makes “Resurrecting the Champ” worth watching. When up and coming reporter Erik Kernan (portrayed by Josh Hartnett) stops a group of teenagers from beating up an old homeless man, his life and career will be changed forever. The man isn’t just any old hobo, or so he says. The man’s nickname is Champ, but says his real name is Bob Satterfield (brilliantly acted by Samuel L. Jackson,) a boxer who was once number 3 in the world. Kernan’s having lots of problems at The Denver Times (yes, you read that right), the newspaper he works for. His boss, a total jerk, is assigning him a boatload of stories, but publishes none of them. Kernan goes behind his back and decides to write a story about the Champ. A friendship grows between the two of them as Kernan’s story lifts him to fame and success he never imagined. Before I go on, here’s a pop quiz: What’s the most important aspect of a main character? That he is likeable, that he’s someone you’ll root for. Even thieves and anti-heroes (like in Ocean’s Eleven) need this quality to be a successful main character. Josh Hartnett’s character of Erik Kernan doesn’t necessarily do anything horrible, or anything like that; he’s a good father, and the things he does wrong in his reporting stem from his jerk of a boss (Alan Alda). But Hartnett’s performance is so incredibly flat and so horribly arrogant that when all is said and done, there’s nothing likeable about him. 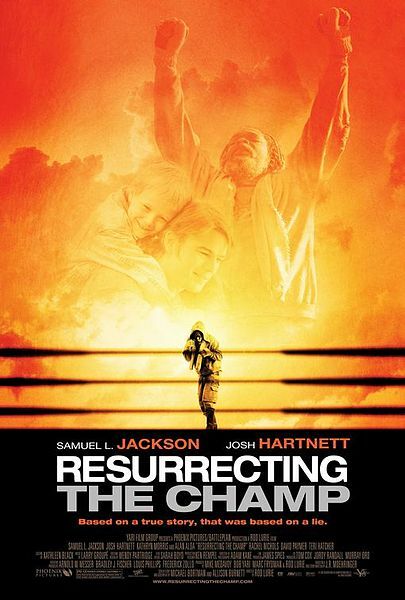 The real problem here is that Samuel L. Jackson’s performance of Champ is so full of life and so likeable that by contrast, Kernan seems like a real jerk. Throughout the course of the movie, Champ does worse things that Kernan does, but the performance is so pitch perfect and fun to watch that when the tiniest thing goes wrong for Champ, you feel for him. When things happen bad to Kernan, you sigh to yourself, thinking Jeez, I just don’t care about this guy. Why isn’t Champ on-screen? Why are we wasting time with this character? I’ve never liked Josh Hartnett as an actor, but after seeing his short appearance in the movie Sin City, where he delivers the film’s final line in a scene that really gets the blood pumping, I was ready to give him another chance. But his performance is not only uninspired, it’s just downright laughable in some parts, and the whole film suffers for it. Samuel L. Jackson, as I said, is excellent in the role of Bob “Champ” Satterfield. He steals the show, and slips effortlessly into the role. In contrast to Hartnett’s uninspired mess of a performance, Jackson was obviously very inspired and excited to take on the role. In a supporting role, Alan Alda is also good playing Kernan’s jerk of a boss. The rest of the movie, such as the plot, the music, the cinematography, is also fairly un-inspired. The plot takes many predictable twists that fail to impress, but in the end serves the film well. Sadly, the overall feel of the movie screams “adequacy.” Still, Jackson makes the movie worth watching, and gets some laughs out of the audience. He’s like something out of a better movie. Seriously. My final quibble with the movie is something that might actually make the movie unintentionally funnier to those who live in Denver. The film takes place in Denver, and the filmmaker’s obviously had little knowledge of the city. Early in the film, Kernan walks out of the Denver Coliseum into a bustling city area, with many shops and restaurants. Anyone from Denver knows that apart from the Coliseum, there isn’t anything in that area apart from a couple of rolling tumbleweeds. Plenty of people chuckled seeing this. When the title of the newspaper was revealed to be “The Denver Times” (whose font and typeset was the exact same as the Denver Post) there was lots of scattered laughs throughout the theater. Near the end of the film, a character talks about the Denver Post and the Rocky Mountain News, implying that this version of Denver has 3 major newspapers, which I believe would be a record. Plenty of eye-rolling ensued in my isle. While people outside of Denver won’t notice this (except for maybe the fact that the film is saying there’s a Midwestern state with 3 major newspapers) it makes the film so much more hokey for anyone actually from the city. Movies need to focus more on making these elements believable, because without the believability, the movie can fall flat in areas. So, overall, it’s not a horrible way to spend two hours, and Samuel L. Jackson’s performance is worth a watch. It might be worth a rent, but I’d recommend checking out “Mr. Bean’s Holiday” instead.